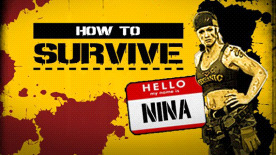 Say hello to Nina, she is a new survivor on the island. Don’t be intimidated by her stone cold looks, you’ll find out it’s always good to meet somebody with different abilities and a mean-looking flamethrower. Need a spark for your life? This character has its own skin, finish moves animation set, skill tree and the mean ability to craft a new weapon type: the flamethrower.